Some of you may remember the crown sheet music that I posted HERE. It’s been quite popular so, I thought I would post this black and white version of the same crown, with out the lettering. This would be another great candidate for iron on transfer projects, like towels, pillows etc. I hope you can find a use for it! 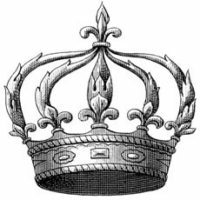 10+ Best Vintage Crown Images! Amazing Vintage Golden Crown Stock Image! Paint by Numbers on Fabric! I haven’t had time lately to play with all of the great images you keep finding. My head’s about to explode from ideas and I love, love, love, this crown! I check out your site so often, but don’t comment enough. This crown, like so much of your treasures, is fantastic! By the way, I have a contest going for bloggers over at Diamonds and toads. You are eligible! Oooooooo the Queen always adores the crowns!!!! Thank you so very much! I heart this crown!! Thank you so very very much! Awesome! I’m so pleased you all like this one. If you make something with it, come back and link it up on Brag Monday so we can all see it!! Can never have too many crowns! This one looks like it could go either way (king or queen) which is great for a couple of things that I have been working on. Awesome crown. I am imagining all sorts of fun and wonderful things for it. Now all I need is some free extra time. LOL Thank you so much for sharing! I LOVE this crown!!! 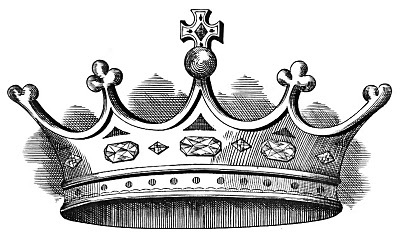 In fact, I love all crowns. Thanks so much for sharing. I have always loved visiting your sites & I thank you for all of the wonderful images that you have provided & created for our use. THANK YOU! 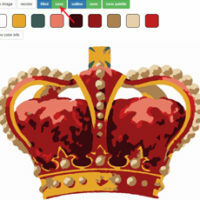 I was going to re-post a couple of your crowns on my blog Crafty Chick’s Retro Fantasy- and of course, link back to your site. I just wanted to let you know. You are such a great resource for us crafters & vintage art lovers. Thank you! Thank You! ~You…my dear, are the Queen! thank you for the beautiful images- you really inspire me ! The Crowns Are Wonderful!!!! So Much Fun to be Had!